A productive day with our small army of Bill Dobson, Ian Pearson, Nigel Hall and myself, but no mice in spite of the tempting bait. After the usual cuppa, work started with the barrow loaded up and off to the running shed. Nigel has worked on the driving wheels for the last two days in view of the good weather forecast for painting. Enormous thanks to him for his dedication as he has now managed to get a first coat of gloss on all the wheelesets. 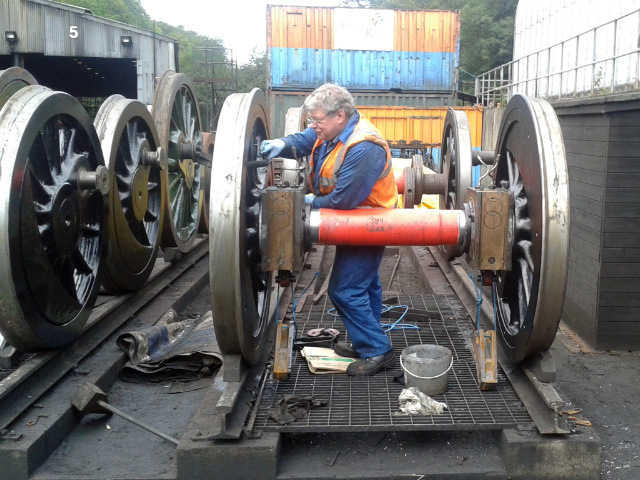 This was important as the MPD has now fitted the axle boxes to both sets and may soon rewheel the loco which restricts access to the back of the wheels. He still hopes that the weather allows him to get a second coat on before re-wheeling commences, but will be in a race against time as the MPD hope to have all the axleboxes on in the next 10 days, with the possibility of a demonstration of the wheeldrop during the Gala at the end of the month utilising the Q6. If not then, the Q6 should be rewheeled early in October. See attached photos. Meanwhile Bill, Ian and I, in a collective effort, stripped both crossheads down as Barney identified them as being quite sloppy when moved up and down. They have now been removed for measuring up and re-metalling if found to be necessary. Clearances are to be checked as there could be rather more tolerance on the Q6 than would be normal on other locomotives. If remetalling is found to be necessary then Barney reckoned that should be completed and the crossheads be available for refitting by Saturday. The crosshead oil boxes were removed (so that the crossheads themselves could be extracted), have been cleaned and marked up. They are now stored in the workshop on the bench at the far end by the cotters. Bill also got Barney to assess the piston rings and it was decided that the rings can be refitted to the pistons but not the R/H leading ring which is damaged. A replacement will be made at the MPD. Ian and I had lunch in Deviation Shed canteen where we had a number of enquiring visitors again looking round the shed, which delayed the tea making! The most common question, unusually, was why was it called"
Deviation Shed"?, so they were given a brief history of the line up to Goathland, and of the site where the signal box and cottages had once stood. Bill and Nigel went down to the Station Café so missed the excitement. I also did the monthly check on the defibrillator. The battery was aslo changed as requested by Martin Lloyd. After lunch, while Nigel continued with his painting marathon, the three of us set about putting the pistons back in the cylinders. This proved quite a challenge, but with the use of the MPD manual small fork lift, some strops and packing, a lot of grunting and heaving, but, most importantly, the wisdom and expertise of Chris Cubitt who happened to come wandering down to see how we were doing - people never learn there is no such thing as standing idly by and watching! - we managed to get the L/H side piston back into the cylinder in time for an afternoon cup of tea. After refreshments, the R/H side was started and this was successfully put into the cylinder, as usual a bit quicker than the first one, but again with some help from Chris Cubitt which was, as ever, very much appreciated. Both piston heads are just sticking out of the front of the cylinder so the rings can be fitted before they are pushed back into place, hopefully on Saturday. Away from the locomotive, all the springs are away at Owens being refurbished. The first four are complete and they are being returned, being due to arrive by tomorrow or early next week, so that, if necessary, the rewheeling can be carried out with the trailing and leading wheelsets only. The remaining four springs are due back by the end of the month or early October. The elements were despatched to Mathew Storey Engineering at Hepscott last Tuesday for new ends to be fitted, and the final flue tubes have been ordered with delivery expected in about three weeks. So after a period of seemingly slow progress, work is now accelerating under Bill's caretakership. He has put together a project plan and critical path analysis for the remainder of the overhaul taking us to completion and back in service by 19 March 2018 at the latest. A copy is on the notice board in Deviation Shed, so do go and have look at it when you are next down. Bill is currently considering whether we should also take the opportunity, now we have missed the 2017 operating season, to replace all the small tubes and possibly lift the boiler to gain a ticket to 2028 rather than 2024 as presently planned, subject as usual to satisfactory annual inspections. He considers this could be achieved well within the time we now have available this winter, and by concentrating on the essential work only this winter, as opposed to the nice to do, it could also be achieved within a 50K budget. He is still working on this, so watch this space. However, regardless, he has identified the last three weeks of October as requiring a significantly larger number of volunteers, than has recently been the norm for the work he has identified, so please look at your diaries and see if you can make it on either a Saturday or Wednesday during that period - more detail will follow in future reports.